So the other day, I posted about Astigmatism and how it can be an unknown side effect to being pregnant. We always think about the glow, the morning sickness, the heartburn, but there are some side effects that some women don't know about and they wonder, "What on earth?" I am only 5'4'' in height. The average height in women (from what I just looked up) is 5'4''. I think it used to be 5'5'', but I guess that's changed. When I typed in the question, "What's the average shoe size for women" this is what popped up. American women, on the average, wear a size 8-wide shoe (American men: size 10.5) - Approximately 68% of American women wear shoes between the sizes of 6.5 and 9.5. Can you guess what my shoe size used to be? You would probably guess in between those numbers and you would be incorrect. Before children, I wore a size 10. The highest woman's average is 9.5. Do you know how hard it is to find some cute shoes or any shoes in a size 10? Shoe shopping has always been kind of depressing for me. Stores don't always carry the same shoe in a 10 as the do for a 9.5. There is only a half size difference. It's like shopping for plus size clothes, we size 10 shoe wearers get the short end of the stick. We get the ugly or plain shoes while you size 8s get the cute sneakers or dress shoes. Guess what size I wear now? After giving birth to 3 children, my feet have grown a whole shoe size, size 11. My feet are so disproportionate to my height. Why does a 5'4'' woman need bozo the clown size feet? You may be wondering why this happens or if the size of your feet really change. I mean, why listen to someone you may not know very well? Someone, however did research, and if you really wanted to look into it, I'm sure that you could find even more research studies about it. You can check out the article here or you can read part of this snippet. The change in foot size may be due to the extra weight women carry around during pregnancy, which puts greater stress on the feet, and, thus, may flatten the arch, the researchers said. In addition, pregnant women produce hormones that increase the looseness of the joints and ligaments (tissue that connects bone to bone), possibly making the foot structure more malleable. All I know, is that it got even more difficult to buy shoes. I'm probably closer to a size 10.5, but you know what, I have never seen that size in stores. So, when I wear my shoes, if I wear a size 10, my toenails feel like they are going to fall off, forget about even running in them. If I wear a size 11, my shoes will mostly fit, but my feet slip around and sometimes that causes some serious heat from the friction it caused. What do I value more, toenails or soft feet? Cute shoes or comfort? I guess, for now, I will just not exercise as much (keeps the heat at bay) and just settle for granny shoes. 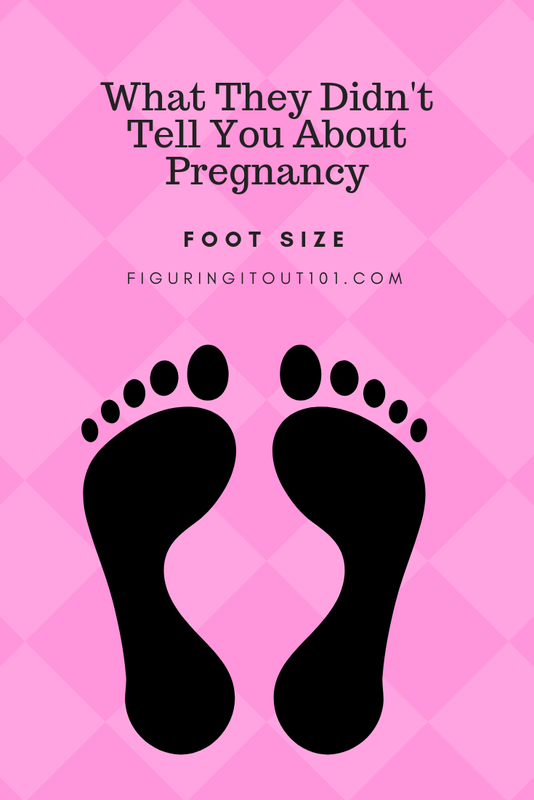 Have your feet changed in size? Did they ever go back to the normal size? When I was preggo with my first born I was very disassembled by the size change to put my feet in a shoe. I remember even tearing up. (Could have been the horemones too) I haven't really boight many shoes since pregnancy so I can't give a true size change, but I'm sure I continue to need wide sizes. I'm not even sure if my dress shoes even for.